Expect some pretty wild stories, plus appearances from characters old and new, copious amounts of action and intrigue, a valuable moral lesson or two, and a fresh minty scent. Excitement? Excitement! 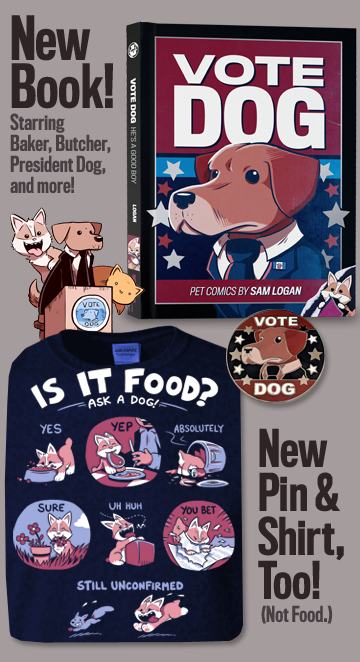 Now here's something a little different -- a comic still illustrated by me, but written by Shannon! (Who, for those of you who didn't know, is my most excellent ladyfriend.) As you can see, she is a very talented writer. Mark my words... someday her novels will be all over your local bookstores' "young adult" shelves. (Hopefully covering up copies of Twilight.) She also writes an online comic of her own, called Daisy Chains! Special bonus feature: Today's comic is actually the second time Shannon and I collaborated on a strip. The first time produced this. True story! Anyhoo, that's a wrap for our filler features. Our next volume kicks off on Monday. Until then, please enjoy our traditional Friday smattering of Q and A! You will find out definitively in future comics! Until then, I encourage only the finest in rampant speculation and unbridled conspiracy theorizing. Now, I know a great trailer doesn't guarantee a great film. And neither does great source material, unfortunately! But you know what does guarantee a great film? Edgar flippin' Wright. I was sold on this movie long before we got to see stuff like this. Now I'm just, I don't know, extra sold. Now I'm sold and also a little giddy. A mix of both, I guess! I started plotting out our current volume when I was about halfway through Volume 4. So, connections to events from around that time, like Fuzzy and Mr. Sin talking about Fuzzy's memory problems, those come from planning ahead. But connections to anything earlier than that, like Sam and Fuzzy's first meeting... those are absolutely just a result of me looking back at old work and writing a new story that can fit into it. When I first started the comic eight years ago, I had no idea what Fuzzy's pre-Sam life was like. I didn't even know how the two of them first met! Since then, whenever I've decided to retroactively expand on the characters' histories, I've tried my best to do so in a way that feels "right" -- that fits into the existing story without feeling awkward or forced. I think I'm doing OK so far, and I hope you all do too! OK, I'll admit it... I'd been having a lot of fun drawing Bat Fuzzy and wasn't quite ready to stop yet. The idea for today's strip came to me at Emerald City, when someone asked me why a character like Fuzzy would ever wind up becoming a superhero. Now you know, random con attendee! Now you know. Speaking of Bat Fuzzy, the limited prints are still working their way over to Topatoco central. But they should be arriving and going on sale pretty soon! I will keep you all posted. Anyhow, that's a wrap for today! 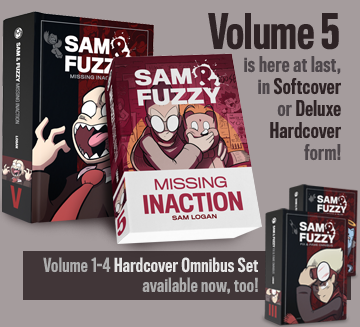 Come back on Friday for our traditional Q & A feature... plus a Very Special Sam and Fuzzy comic.